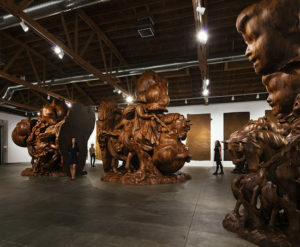 If you had a chance to visit Hauser & Wirth this summer, you likely encountered Paul McCarthy’s monumental walnut sculptures of characters from Snow White. The artist filled the room with immaculately grotesque interpretations of the fairy tale, daunting viewers with a spectacle of twisted dwarves and orgasmic princesses. The show closed at the end of September, but I had the privilege of visiting the artist’s studio through LACMA’s leadership Council and AHAN (Art Here and Now) last week, gaining a better understanding of how such structures could even be conceived. McCarthy’s studio is more akin to an airline hanger space than the usual artist space, as we walked through a vast warehouse expanse housing even his most impressively scaled works (including an entire saloon set for his current film). To say McCarthy is prolific would be an understatement. The entire experience was as detached from reality as the artist’s work and we cycled through years of projects, engineering feats and artistic discoveries.